DSLR Bot is an iOS app for controlling Canon EOS cameras via infra-red signals, allowing videographers to trigger recording from a distance using an iPhone, iPod or iPad. It's the work of Antonio A Santiago, who is, interestingly enough, a talented visual effects artist and painter too. The app can be downloaded from the App Store and installed in minutes, but since the iPhone doesn't have an IR transmitter, you'll have to purchase one from the DSLR Bot web site or make one yourself. I received mine from DSLR Bot (posted from Australia to the UK) in a few days, and it's well made. It consists of a pair of infra-red LEDs in a rubberised mount and a sturdy, cloth-covered 3.5mm jack extension lead of 1.5m in length. This transmitter cost about £16$20 including postage, and is certainly better quality than anything I could've built myself. However, if you're up for a bit of DIY soldering, it's pretty easy to build a transmitter. A link is provided to Instructables.com, giving a steb‑by‑step guide to creating one from scratch (http://www.instructables.com/id/DIY‑Infrared‑transmitter‑for‑iPhone‑iPod). 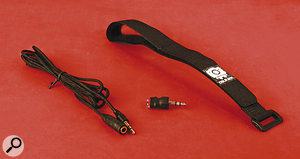 The IR transmitter comes with a branded velcro strap for attaching it to the lens, which is very useful when you can't get to the front of the camera, or bounce the signal off a wall. To use the transmitter without the extension, I found that I had to partly remove my protective iPhone case (the same is true of some headphones too) as the connector is quite wide. Setup is pretty painless: you just have to make sure that the EQ, Sound Check and Volume Limit settings in the iPod menu are deactivated, as they can interfere with output of the LEDs. Once this is done, launch the app and turn the volume to maximum, then test that the transmitter is working. This can be done by pointing it at a webcam (which will not usually have an infra-red filter) and checking that the lights appear to flash purple. Apple's Photobooth is particularly useful for this test! I was using DSLR Bot with a Canon EOS 550DRebel T2i, though it'll work with many EOS models, including all of the video‑enabled ones (5D MKii, 7D, 60D and 1D MKiv) currently available. The two most useful modes for videographers are Movie Mode and Time Lapse. To use the time‑lapse mode, it's necessary to switch the camera's 'Drive Mode' to 'Self Timer/Remote Control', and to use video mode the 'Remote Control' setting in the first page of the menu must be set to 'Enable'. Movie Mode is pretty simple, and allows triggering of the record button remotely. DSLR Bot will also keep a record of take length to the nearest second. Though it'd be nice to see frame‑level accuracy here, it's probably not possible, due to the one‑way communication that infra-red offers, and the slight delay between the camera recieving the message and recording being triggered. Each take you trigger can be named, but since the video files on the camera will be named differently, you'll have to use the length, date and time to match them up to your selected and named takes. After marking your favourite takes with a tick, you can export the shot list via email. Time Lapse mode allows still images to be taken at intervals, which is perfect for creating emotive video sequences.Time Lapse mode acts as an 'intervalometer', allowing you to set an interval for still capture and a total number of frames. Intervals can be anything from a second to (a slightly less useful) 365 days, allowing you to capture changes in a scene over time. Using still images for time‑lapse video is far preferable to time‑stretching video footage, because DSLR still images are orders of magnitude sharper than video images. DSLR Bot saves you buying and carrying around a separate intervalometer for time‑lapse shots, which is a bonus. All in all, this is a good little app: it's not expensive, and the interface is easier to use than that of an intervalometer. Shot logging is quite useful, and can save you scrambling around for paper on set. The limits of infra‑red control mean that information transfer is one-way, but DSLR Bot is still useful for specific tasks, expanding creative opportunities for DSLR time‑lapse video for not much cash or effort at all, especially if you already have an iOS device. Alternatives to this app include a hardware remote control or an intervalometer ('official' and third‑party options are available). The BlueSLR iOS app (http://usd.blueslr.com) uses a $149 bluetooth receiver to communicate with the camera. It currently only works with Nikon models, but an update is pending. Inexpensive and simple remote control. Digital shot‑logging is a bonus. Limited, one‑way control via infra-red. DSLR Bot is a simple app that works well. The limits of infra-red control mean that functions can't be expanded much at the moment, but it's certainly a convenient tool for remote video work. Perhaps control of cameras from other manufacturers could be included in a future update?